In my continued quest to gather suggestions from readers to find the best pizza in Northeastern Pennsylvania, I had to get to Alfredo's in South Scranton. I have eaten at Alfredo's a couple of times in my day and had good experiences, but I've been hearing nothing but great things from the MILLIONS and MIL - OK maybe TENS and TENS of NEPA pizza review fans. No matter the number, I had a high volume of positive feedback, and a hot date that was just itching to see what a pizza review was all about (heavy on the sarcasm with wanting to participate in a review!). So without further ado, we headed to south side to team up and discuss pizza of all things! If you haven't been at Alfredo's, it's a cool place where you can grab a drink at their full service bar, and some great Italian food in the restaurant. It's a pretty classy, yet relaxed atmosphere. After we were seated in the dining room, we placed an order for 1/2 tray of red pizza at a cost of $6.95. The pizza was ready in a jiffy, and quickly delivered to our table on a neat pizza serving paddle. The first thing I noticed was the thick layer of cheese on the top, which I personally was pretty excited about. I also noted that the pizza appeared cooked thoroughly, as the crust looked crispy and the cheese was nicely browned around the edges. After jotting down my initial thoughts, it was time to take the taste test. The anticipation built as I took my first bite and I waited for the payoff of this much hyped pizza. To my surprise, and dismay, there was nothing - no flavor explosion, no crunch, and no substance. Could this be correct? Perhaps my taste buds failed me? I took another bite, nothing. Well, it was more than nothing, but certainly not what I expected. The generous portion of flavorless cheese just dominated the pizza and didn't permit any other flavors to poke their respective heads out. Where I thought the added cheese was a bonus, it turned out to be one of the downfalls of this pizza. The sauce was difficult to judge because there was so little of it. The tray was like a flavorless white pizza with a touch of sauce added for color. After peeling off the layer of cement - I mean cheese, I was able to locate just enough sauce to analyze. The little sauce I was able to sample was actually quite good. My fellow reviewer was half tempted to ask the waitress for a side of sauce, I laughed a nervous chuckle still in disbelief that we would have to entertain such a notion at such an esteemed establishment. Without harping too much more I'll summarize by saying cheese and sauce proportions were way off and really prevented us from enjoying this pizza. To make matters worse, the pizza shell was tough and leathery. It was the type of crust that you have to chomp into and pull away - kind of like the Macho Man "snappin' into a Slim Jim." I am unable to describe the flavor of the crust because there either was none, or the mammoth layer of cheese drowned out the taste. Either way, it took an extensive amount of time and effort to finish cutting a slice out and serve to my co-reviewer, which is a pet peeve of mine when a pizza-maker can't (or won't) cut all the way through the crust to be served to the customer. By this time, I think you might be getting the impression that we were not served a good pizza, and this pizza critic probably won't get another date (not because of the pizza, but because taking someone to review a pie is LAME!). I will say this: regardless of the quality of this pizza, I have had great meals at Alfredo's, and know of many friends who swear by it. Before this experience I would have considered it a can't miss for just about any occasion, and to be honest I still do. Every place has an off day and I know that this pizza is not representative of their normally consistent product. Although this pie was more akin to a storebought box of Nardone's flavorless pizza, I know that this pizza is more the exception than the norm. 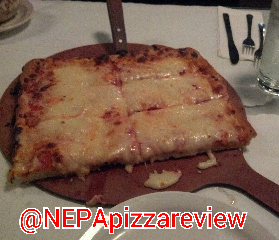 I would continue to recommend Alfredo's Pizza to NEPA Nation because they typically do have great food and are highly regarded in the area. I agree in general with the "OF style' review. People who like a lot of cheese and not a lot of spice will like this pie. When a group of us recently dined on both this and the round red, everyone, mostly 'OF style pizza' veterans, preferred the round red. As I recall, it had a better sauce to cheese ratio, probably a different cheese/blend, and the crust fared better too. The pizza we prefer to order here is a sun-dried tomato/spinach blend on whole wheat crust. We like this but, needless to say, everyone has a different idea of 'good' pizza. It is a nice place as can be seen by the brisk business they do. Besides the pizza they have other nice menu items. I would like to see them get a bit more creative and add some real 'craft' beers, preferably on draft but if not, at least in the bottle. I think they'd go well with the place's trendy but relaxed style. You provide a very accurate assessment in my estimation. Alfredo's has incredible food, but I was not aware that they offered a round pie. It sounds to me I would like that a lot more. I agree with you on all points. Do you do any blogging? You seem to have a very keen sense of what's going on in the restaurant world! I occasionally post a review or comment on various reviewing sites. I don't range too far. I tend to return to places I like and avoid those not (like most folks). 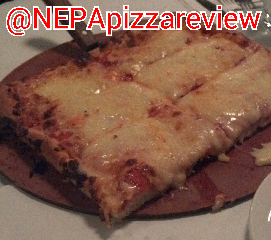 I do enjoy trying various pizzas ... again not that rare, but in NEPA a veritable treasure trove of choice and variety. OF style, which to some isn't 'real' pizza (mostly NY/NJ/etc transplants and visitors...), adds another dimension for exploration and discussion. Your site is nice...and serves a good purpose, IMO. By the time you cycle through most places in even a subset of NEPA, it will be time to restart the tests. A formidable task but a labor of love I'm sure. Well I certainly value your input. If you ever get the urge to do a guest blog post, please let me know and I'll post on the website. I couldn't agree more with you - we do have the best selection of pizza around (most sections of the country have terrible pizza) and Old Forge is a nice cenerpiece for discussion and enjoyment. For the record, I believe Old Forge pizza is real pizza, just the same way that frozen pizza is real. Each pie has a story to tell - some might be amazing, and some might be terrible. That's the beauty of pizza, they are all different and invoke conversation between people. That's definitely the most fun part of writing this blog. It certainly is a big job, but as you said it's a labor of love and I have a blast doing it. I will definitely make my rounds, but for now I have a very long way to go which means I'll never run out of stuff to write about!